Oh Pep! Makes Unpredictable Pop : World Cafe The Melbourne-based band has always got a bent note or quirky chord progression up its proverbial sleeve. "What's The Deal With David?" "Your Nail And Your Hammer"
Melbourne-based band Oh Pep! caught a ton of well-deserved buzz with its 2016 debut album, Stadium Cake. The duo wound up on international festival dates and capped off a whirlwind tour sharing the stage with Billy Bragg at Glastonbury Festival. 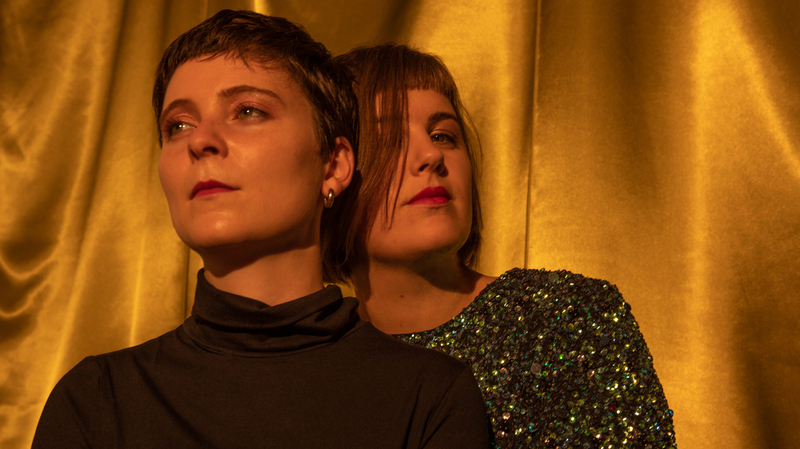 After taking some time to shake their heads and process it all, members Olivia Hally and Pepita Emmerichs are back with a follow-up album called I Wasn't Only Thinking About You..., which showcases the duo's penchant for unexpected musical choices. Oh Pep! have always got a bent note or quirky chord progression up its proverbial sleeve, as you'll hear in this studio performance. They've also got some unconventional source material. Olivia and Pepita explain how the experiences of waiting in line for a social security number and witnessing a particularly spooky snowstorm in New York City inspired new songs.